The challenge? A particular wedding client bent on having amazing lights at a historic library with strict wiring and setup regulations. The solution? The ADJ WiFLY Series, a wireless DMX Transceiver with compatible battery-powered LED fixtures – offering a quick, setup for creating brilliant mood lighting. The result? Happy clients… happy guests… and rave reviews. 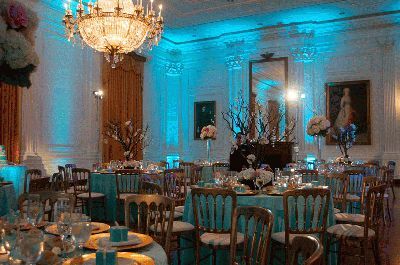 When the Glam Event Stylist group (Lomita, CA) was asked to design a wedding look inside the White House room of the Richard Nixon Library, the company immediately hit some hurdles. The clients, who had attended many past weddings, were resolute about achieving a flawless look with the lighting. The historic building, a 47,000 square foot library and birthplace of President Richard Nixon, also had strict regulations on setting up in a clean manner, with no wires or taping. On top of that, lighting was only one part of the job, which required full room décor with limited setup time. 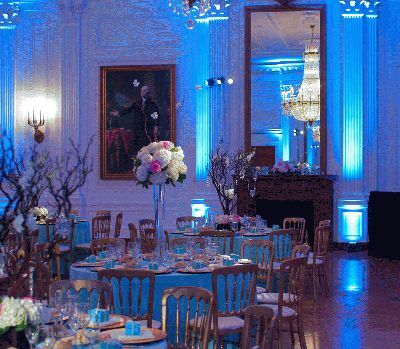 Glam Event Stylist found a solution to this challenge by choosing the ADJ WiFLY Series to set the mood. This new, easy-to-operate wireless DMX series includes the WiFLY Transceiver (a Transmitter/Receiver in one), designed for use with a collection of lithium-battery-powered color-changing WiFLY LED fixtures. When connected to a DMX controller, the WiFLY Transceiver will send a constant and reliable wireless DMX signal to other ADJ WiFLY products from distances up to 500 feet, eliminating the need to run DMX cable. Since the WiFLY fixtures themselves run on their own built-in rechargeable batteries, no power cords are required either. To achieve saturated tones that complemented the wedding colors, 20 WiFLY fixtures were used in total, including the WiFLY Par QA5, a compact par can with 5 x 5-watt RGBA Quad LEDs, and the WiFLY Bar QA5, a 20-inch (0.5 meter) linear LED fixture also with 5 x 5-watt RGBA Quad LEDs. The WiFLY Par QA5s were used to accent pillars and distinctive room features with rich color, while the WiFLY Bar QA5s covered walls and space with warm, brilliant uplighting that filled the room - all with no outlets or daisy chained fixtures. According to Nancy Flores, Designer/Co-owner at Glam Event Stylist, the WiFLY series surpassed everyone’s expectations. “At the end of the night [the client] was really impressed and thankful,” said Flores, adding that her customer mentioned that the lighting in particular had been done well. The advantages to the design team were even more impressive. “It cut our setup time by more than half. We were able to spend more time on other details,” said Flores. This not only allowed more time for other parts of setup (an important detail considering the design company was decorating the entire room), it also eased what could have been a labor intensive install job. The WiFLY Series offered a simple solution with successful results for everyone involved – including an unforgettably beautiful wedding event.